On June 4, 2018, Basiani will travel to France. 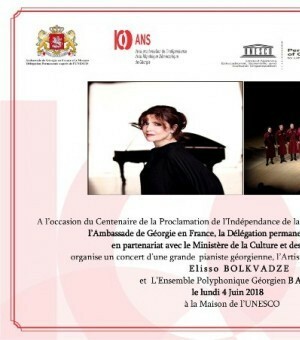 A joint concert of the outstanding Georgian pianist, UNESCO’s Peace Ambassador, Eliso Bolkvadze and Ensemble "Basiani" will jointly perform at the UNESCO head office in Paris. The performance shall take place in the Concert Hall for 1500 people at UNESCO HQ to celebrate the 100th anniversary of Georgia's independence. The official representatives of France and Georgia will attend the concert. The project is implemented with the support of the Ministry of Culture and Sport of Georgia and the Embassy of Georgia in France.